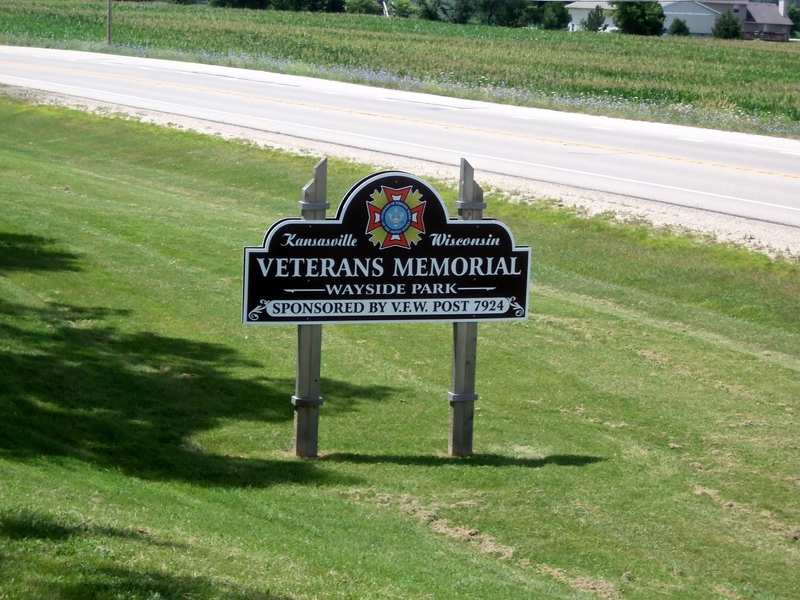 There are a number of roadside memorials on the highways and byways of Wisconsin roads. Most are small and at best have a place to park and a picnic bench or two where you can enjoy your lunch off the highway. One of the larger ones I’ve seen is located near our new condo in Kansasville, Wisconsin. Kanvasville is a tiny dot of a town close to a slightly larger dot of a city named Union Grove (pop. 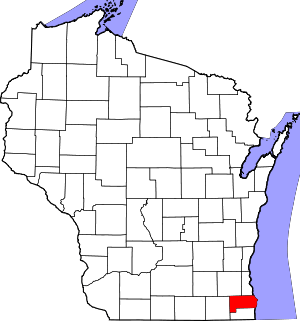 5000) Both are in Racine County in SE Wisconsin. The park is sponsored by the local Veterans of Foreign Wars post. 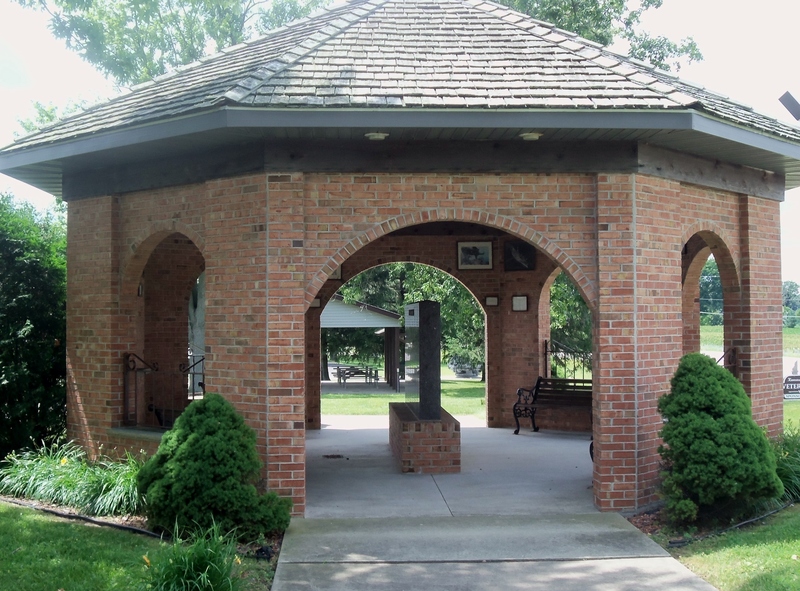 It was dedicated in 1996 and is dedicated to veterans from the WW1 era to 1996. The area all around the memorial is Wisconsin farmland. 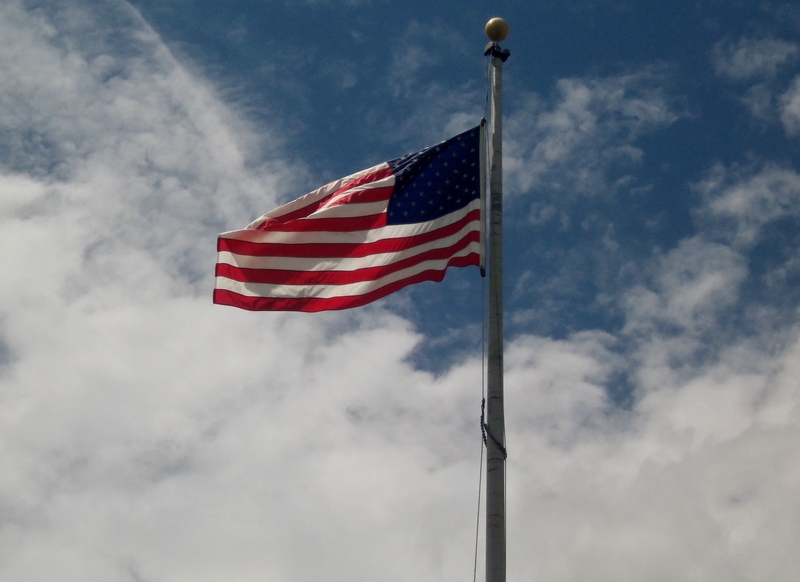 Underneath Old Glory flies a POW/MIA flag. 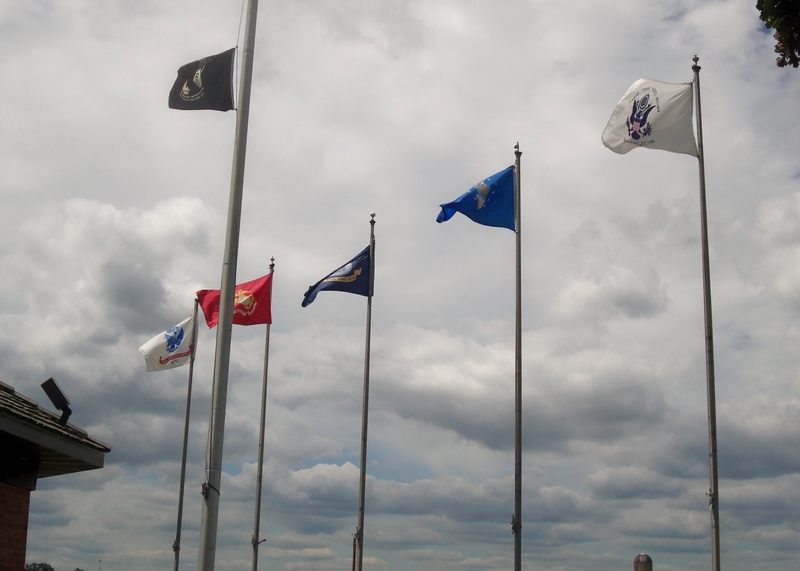 A Wisconsin State flag is flanked by the Navy, Marines, Air Force and Coast Guard flags. The centerpiece of the memorial is a small chapel like building. The interior features pictures of Wisconsin men killed in WW2 as well as scenes from WW2. One exception was a picture of US soldiers jumping out of a Huey helicopter during the Vietnam War. The building is in good shape but a number of birds have made nests within it and as a result you have to watch where you step! 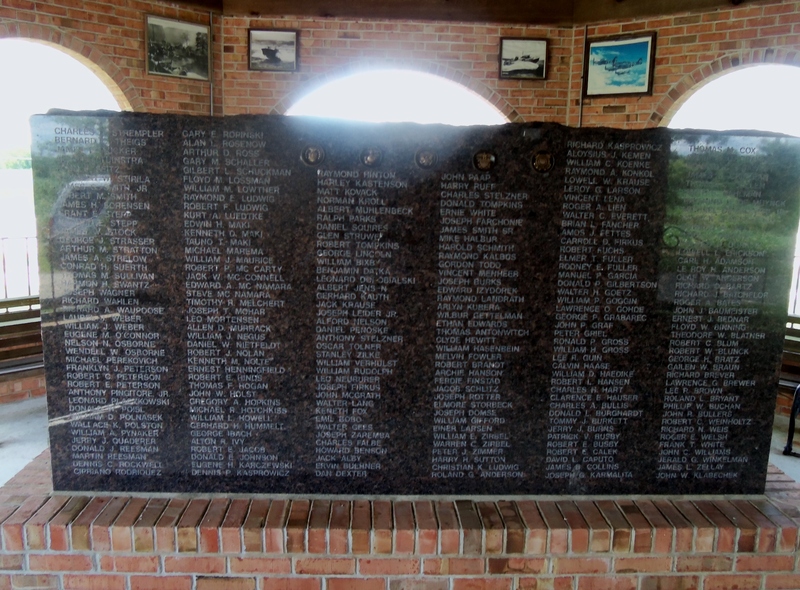 In the center of the memorial there is a large marble memorial with the names of men. I could not find if the men were from all the wars between 1918 and 1996 or just from WW2. The memorial building itself has a WW2 feel to it so the names may be all the Wisconsin men from the area killed in WW2. There are names on both sides. M60A3 tank. The tank is a Cold War Era tank. It would be the main battle tank until the advent of the M1 Abrams of Gulf War fame. 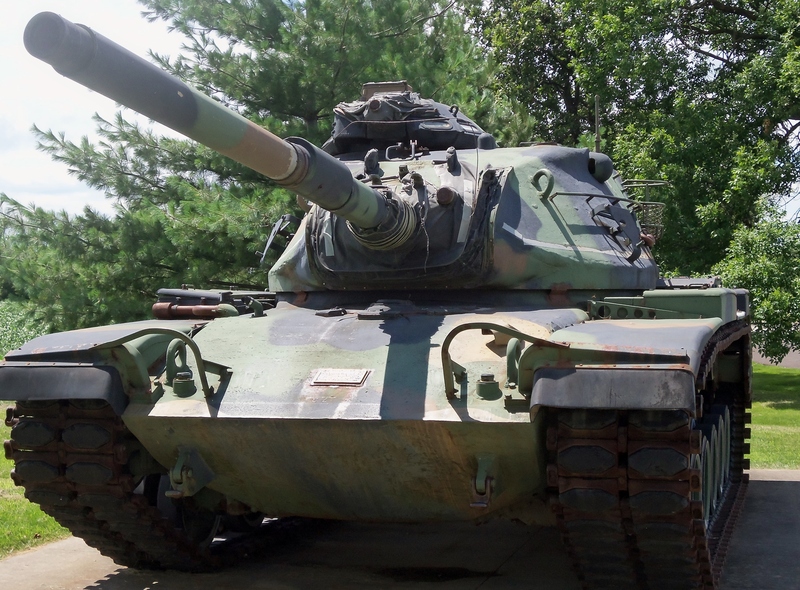 The M60A3’s would be regulated to National Guard units by the late 80’s. 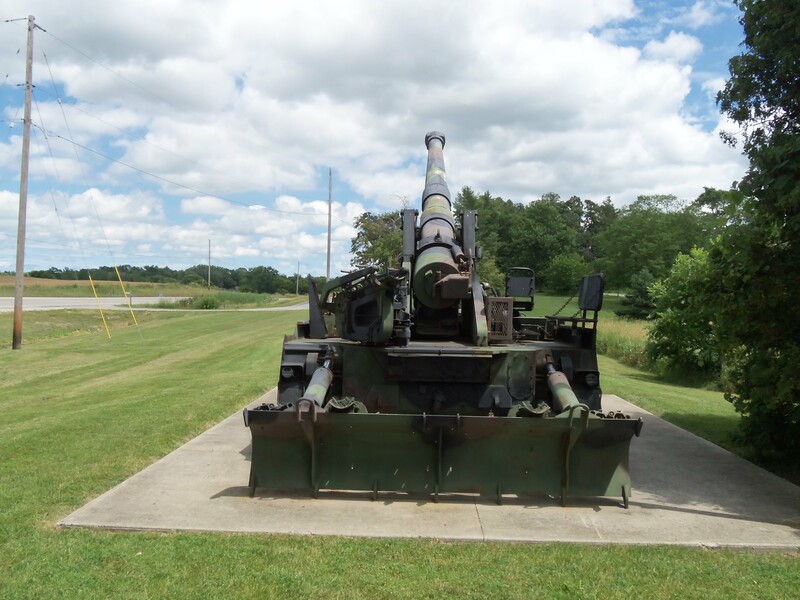 This one was donated by the 632nd Armored Bn. of the WI National Guard. 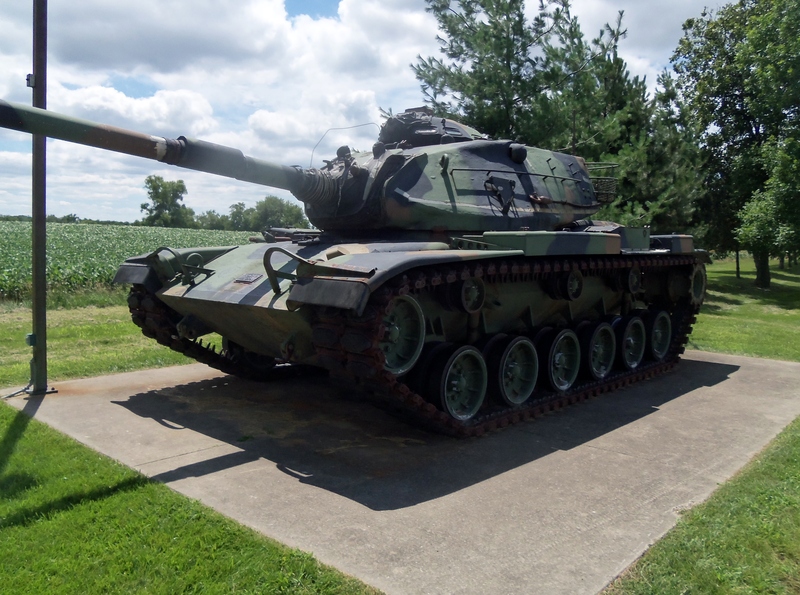 Another view of the M60A3. If memory serves me the gun is 105mm high-velocity NATO gun shared by Britain, W. Germany and other NATO countries. 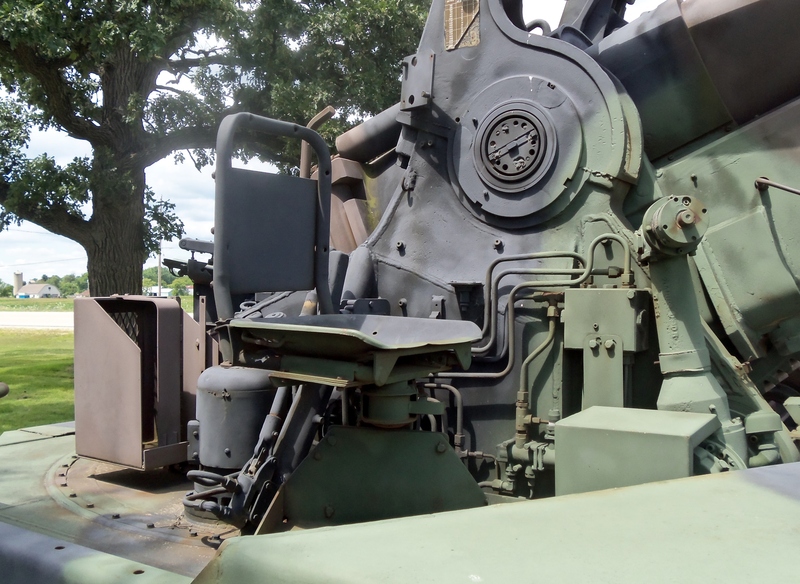 This is a twin 40mm anti-aircraft mount from a WW2 or Cold War ship ranging from a Destroyer to a Battleship. Eventually anti-craft mounts would be replaced by anti-aircraft missile systems and Gatling Gun type Phalanx systems on US ships. 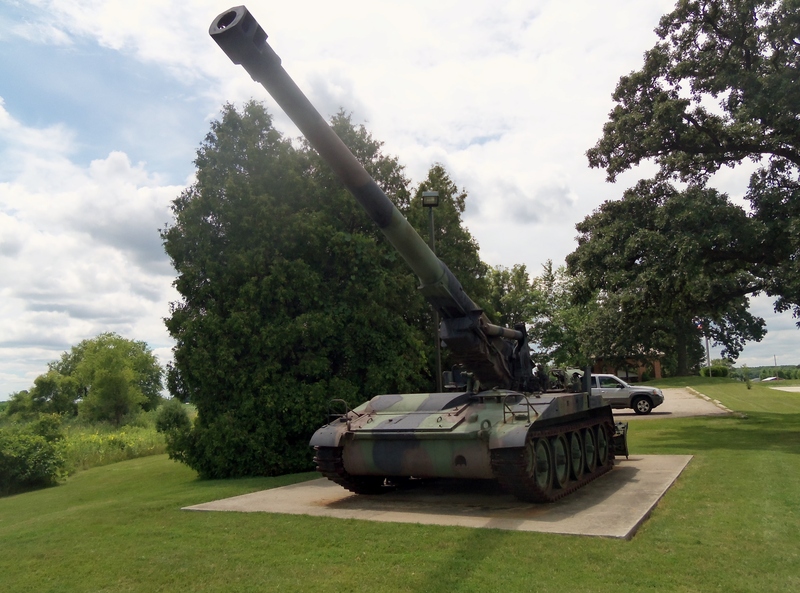 This is a massive 203mm self-propelled howitzer also from the Cold War Era. 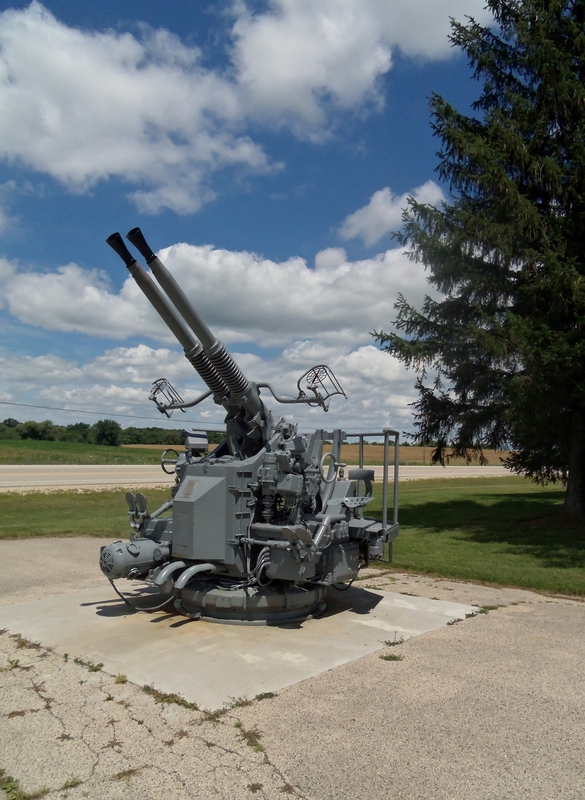 203mm is roughly 8″ the same size gun found on WW2 era Cruisers. 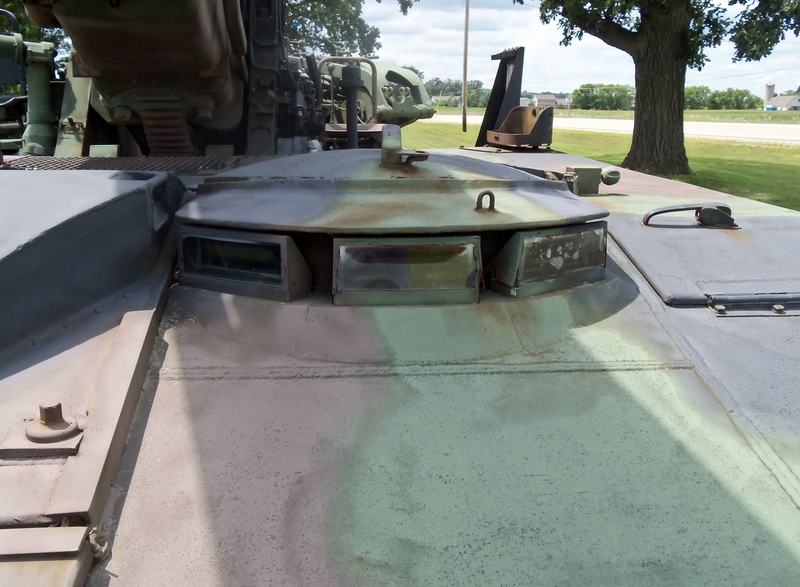 I think these are the driver’s viewing “windows.” These guns were retired from the US Army in 1994 but were used by the British Army in the first Gulf War. The crew would be exposed when firing this massive weapon. The range of the gun is about 25,000 meters or 15 miles. 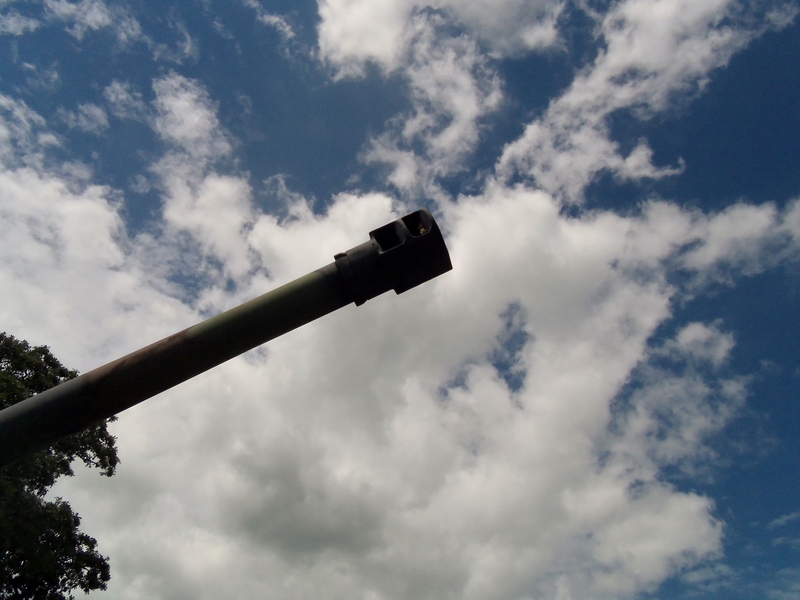 The muzzle break of the howitzer. One round weighed a massive 200 lbs! On the day I stopped there was one other visitor-a man in van from the local cable company. I was not there long myself, maybe 30 minutes or so. It was enough however to remind me that freedom is not free. Thank you V.F.W. Post 7924 for providing this park and place of reflection.